Ross Burkinshaw looks set to end his nine-year boxing career at the age of 29. A shoulder operation is not healing as quickly as his medical advisers would like and he admits it may now be time to hang up the gloves. ‘Ross the Boss,’ the former solider whose rink entrances are amongst the most stirring in British boxing, said of his shoulder: “I haven’t got as much movement in it that my surgeon would like. “I wouldn’t like my career to be over, but the way things are healing...I am not even allowed to shadow-box until February. “Hopefully, it won’t be over, I have come back many a time before. I am the comeback kid. “But this time I have never felt pain like it” said the Sheffield fighter, who has suffered a string of serious injuries. The balance of probability was that it was more likely he would retire, than carry on, he conceded. The bantamweight said he knew “first-hand about depression in boxing, through injuries. He added that in the last three years he has had six operations, and his wife “is the one that has to look after me. 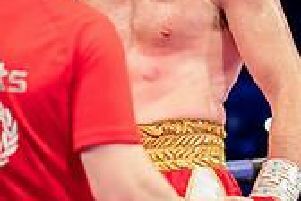 Mrs Burkinshaw said: “He is coming out on a high; he has won the English title, Commonwealth title, WBO European title he was ranked eighth in the world until this injury occurred. The couple have two sons, Pharrell, 12 and Reuben, seven. Burkinshaw has already taken steps to protect his earning-power, post-boxing, and will be running the ‘Boss Box Fit’ gym at the Herdings shops on Morland Road, Gleadless, in conjunction with promoter Dennis Hobson. “I am putting all the foundations down in case it is the end of my career” said the boxer, who is a 50-50 partner with Hobson in the venture.